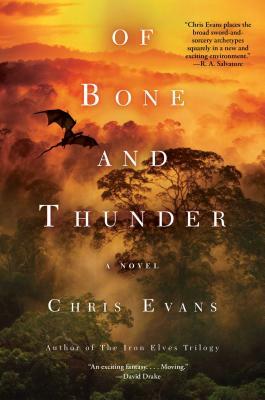 Fantasy author Chris Evans masterfully pushes the boundaries of the genre in his brilliant, groundbreaking new epic, a unique and penetrating vision channeling the cultural upheaval, racial animus, and wholesale destruction of the Vietnam War. Here, in the distant nation of Luitox, which is wracked by rebellion, thaumic users copilot mammoth armored dragons alongside fliers who do not trust their strange methods. Warriors trained in crossbow, stealth, and catapult are plunged into sudden chaotic battles with the mysterious Forest Collective, an elusive enemy with a powerful magic of its own. And the Kingdom's most downtrodden citizens, only recently granted equality, fight for the dignity they were supposed to have won at home while questioning who the real enemy is. Of Bone and Thunder is the story of Thaum Jawn Rathim, whose idealized view of the war clashes with its harsh realities and his realization that victory may cost him everything...of conscripted soldier Carny, awash in a hallucinogenic haze of fear and anger...of Breeze, the red-haired graduate from the Royal Academy of Thaumology, certain she can transform the very nature of warfare--if only she can win the trust of the man holding her fate in his hands...and of Ugen Listowk, a veteran crossbowman who finds solace in the darkest shadows of the jungle and whose greatest fear is failing the men he leads into battle. Plunging deep into the heart of a moral and mortal darkness, these reluctant soldiers struggle for survival and for meaning amid a blazing drama of blood and magic. They will duel a ghostly enemy, fight to understand their roles in a sprawling maelstrom, and ultimately wage the war their way--not for glory or the Kingdom, but for one another.